The Daily Telegraph's 'War on America' front page has been voted the most memorable of the last hundred years in Newsnight's Big-Read-All-About-It initiative. 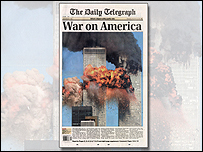 The front page from September 12, 2001 featured the unforgettable image of New York's Twin Towers ablaze, in a picture that covered almost the entire page of the broadsheet newspaper, together with the simple headline 'War on America'. 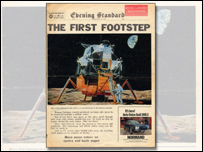 It picked up 22.9% of the final vote, followed by the Evening Standard's 'The First Footstep' (15.1%) - reporting the first manned landing on the Moon - and The Sun's controversial 'Gotcha' front page on the sinking of an Argentine cruiser during the Falklands War (9.9%). The result was announced by Newsnight presenter Martha Kearney at a live broadcast from the British Library in London, where an exhibition, Front Page, was opened by the Queen earlier this week. Our resident historian - and former Fleet Street reporter - Greg Neale reports on a century of newspapers, our shortlist - and the ones that almost made it. 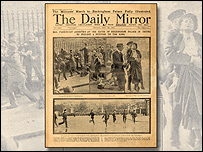 The militant campaign by the suffragettes to get women the vote represents a major 20th century movement as women progressively sought equal rights - in politics, at the workplace and in all other areas of life. Clare Short, Labour MP and former minister, argues the case. 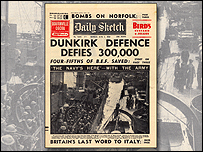 The seemingly miraculous escape of 300,000 British troops from Hitler's advancing armies in an armada of "little ships" was greeted at home as proof that Britain could survive to fight on against the Nazis. Paddy Ashdown, former Liberal Democrat leader and one-time commando, argues it was a genuine turning point in the Second World War. Athlete Linford Christie talks about how sport moved from the back page to the front, and an event that had a personal significance for him: the demonstration on the victors' podium by two American runners at the Mexico Olympic Games. US astronaut Neil Armstrong's famous "one small step for man, one giant leap for mankind" as the Apollo XI commander became the first man on the moon, was a defining moment. 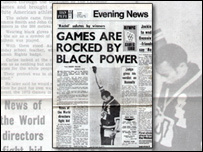 Broadcaster Adam Hart-Davis argues for the event's historic importance. 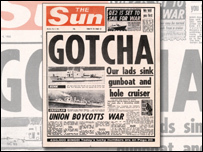 News of the sinking of the Argentine cruiser General Belgrano by a British nuclear submarine, during the Falklands war, was greeted enthusiastically by "the paper that backs our boys" - though the headline was changed to Did 1500 Argies Drown? for later editions. Germaine Greer argues that it epitomises a disfiguring trait in modern tabloid newspapers. A confection of manufactured tabloid trivia - or an iconic comment on modern "celebrity" culture? This front page has become a byword for modern pop newspapers. 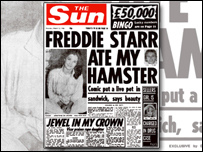 Its subject, comic Freddie Starr, tells all, as they say on Newsnight at 2230BST on Wednesday 24 May. Watch him on BBC Two and live on this website. Britain's relationship with the rest of Europe has often been a fractious one over the last hundred years, with tensions within and towards the European Union dividing the main political parties. 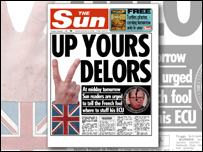 The Sun's headline marked a new turn in an old argument, says Conservative MP and former Telegraph Brussels correspondent Boris Johnson. 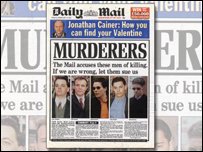 The murder of Stephen Lawrence, a black student, in south London, was elevated to symbolic status when the Daily Mail accused a group of men of a racially-inspired killing. No convictions resulted, but the case was one of several that highlighted the stresses of race relations in a changing Britain, argues Gurinder Chadha, director of Bend It Like Beckham and Bride and Prejudice. 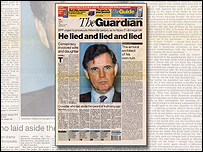 The disgrace of former Tory minister Jonathan Aitken, who would be jailed for perjury, represents the power of the press at its best - challenging those in positions of authority. Writer and comedian Barry Cryer aims to get to the truth. An unforgettable image, of New York's Twin Towers ablaze and falling, together with a simple headline, and covering the entire page of a broadsheet newspaper. Dame Pauline Neville-Jones, former diplomat and chair of the Joint Intelligence Committee, argues that an event that seemingly ushered the world into a new era of uncertainty, has enduring significance. Advocate: Kelvin MacKenzie Britain's troubled relations with Ireland in the 20th century saw the Easter Rising, the birth of the Irish Free State - today the Irish Republic - and from the late 1960s, the Troubles. 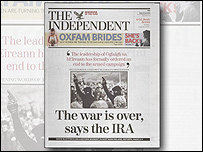 Kelvin MacKenzie, former editor of The Sun, argues that the Independent's treatment of the story reflects a vitality more typical of the tabloids.